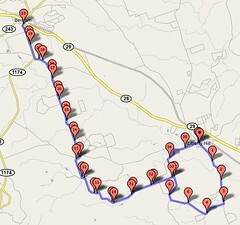 I did an out and back ride this morning – with a bit of a loop at one end – from Liberty Hill to Bertram and back. 36 miles or so. I got up at the crack of dawn to make the drive out there. My attempt to avoid the heat. Not much chance of avoiding it today though – or any time this summer it seems – but I gave it a shot. Me and a bunch of other cyclists as it turns out. Other than the buzzards, hawks, cows and a few pickups, we were about the only things out there this morning. Who knows what it got to today, it was surely well over 100. That’ll easily make 40+ days since May it’s been at or over 100. I lost count around day 37. This morning though, it didn’t actually seem that bad. Not sure whether it was just the early hour or the breeze, or maybe a little less humidity? Anyway, it just didn’t seem quite so bad this morning. Maybe I’m just used to it at this point. Maybe I got more sleep last night. As I neared the end of the ride, I passed an open field with some cows in it. There was little or no shade to be found in the field except in one small place. A large real estate sign created a shady spot and that spot was home to as many cows as would fit in the shade. And I thought to myself: those must be some smarter than average cows. You’ve heard the old saying: “he hasn’t got the sense to come in out of the rain”. Around here, maybe we should say “he hasn’t got the sense to come in out of the sun”. Do you suppose those cows were thinking they had more sense than I did today?